It’s E3 time again and Microsoft’s big press event has taken place today, with plenty of big news coming out of the guys in Redmond. Microsoft could probably have gotten away with simply announcing the fact that the Xbox One is receiving an update that will make it backward compatible with Xbox 360 titles, but it wasn’t going to stop there. Instead, it set about providing one of the most compelling videos we’ve seen at an E3 to date. 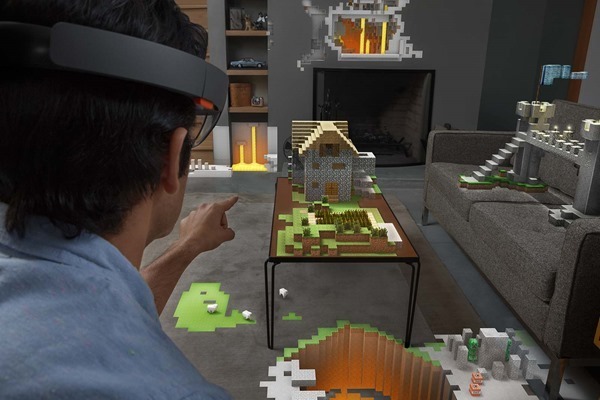 Until now many were still scratching their heads at the thought of Microsoft paying $2.5 billion for Minecraft, but after seeing Microsoft demonstrate what its HoloLens is capable of when married with the world building game, things should now be a little clearer. HoloLens is Microsoft’s attempt at a headset that provides augmented reality functionality to whoever happens to be wearing it. Such tech always makes for great technology demonstrations, but it’s only when a killer feature appears or integration with an app that we are all familiar with arrives that augmented reality starts to truly make sense. When that app is a game that is played by a ridiculously huge number of people, dollar signs start to rack up. And so on to the demonstration. The whole concept revolves around one guy on-stage wearing a HoloLens headset and playing Minecraft. That’s all well and good, but prepare to have your mind blown when he starts to play a miniature 3D version of the game on the top of a tablet that’s sat in the middle of the stage. To call it magic doesn’t truly do this thing justice, and even though we don’t quite know where we want HoloLens technology to go beyond Minecraft, we know it could be huge. For now the best thing we can do is suggest you watch the 4-minute video for yourselves. It’s worth the time, and if it doesn’t leave you giddy with the idea of what could be around in another five years, then you have no soul. Be sure to let us know in the comments section below what you think about the video. It’s pretty cool isn’t it? It definitely is! the original video is smooth, the video here is NOT smooth… wtf ? It’s very impressive tech but the FOV is just to bad for it to be of any use in a gaming sense. It’s more a proof of concept type thing. You mean as bad as your sentence structure and syntax? Reading your response made me more worst dumberest. Thanks alot? who care. go suckdi+cks idiot.